Suggested airport for your arrival is the JFK Int'l Airport (JFK), LaGuardia Airport (LGA) or Newark Liberty Int'l Airport (EWR). Your final documents will include the available transportation options to the hotel upon your arrival. An inside look into Baseball - Enjoy stories and Q&A from former Big League Umpire of 26 years - Al Clark. Learn more about Ump's Eye View here. Half-day tour to give you an overview of the sights and sounds of the city including 9/11 Memorial. Tour lasts 45 minutes to one hour and includes visits to Monument Park, New York Yankees Museum, the Clubhouse/Batting Cage Area and the Dugout (tour and areas visited are subject to availability). The Ford C. Frick and J.G. Taylor Spink Awards presentation Saturday afternoon. Join the pageantry and excitement as the Hall of Famers ride in trucks provided by Ford Motor Company down Main Street on their way to a private reception at the National Baseball Hall of Fame and Museum. Staging for the Parade takes place at Doubleday Field and fans are encouraged to attend the Awards Presentation prior to making their way to the Parade at 6:00 PM. The Ceremony is expected to last two to three hours. Refreshments are sold at the site. "It's the weekend they've worked for all their lives. 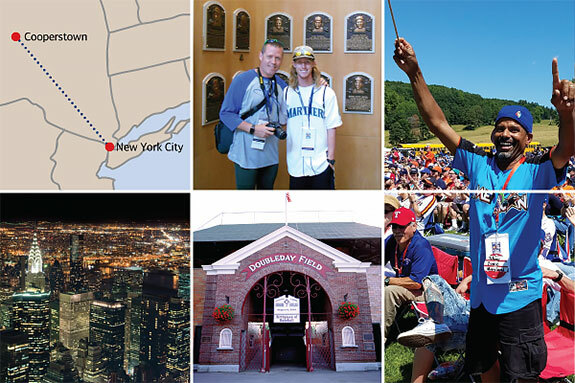 And with memories of their Hall of Fame inductions fresh in their minds, new inductees will be ready to reminisce with fans during the annual Induction Weekend Legends of the Game Roundtable event in Cooperstown." Transportation to Albany Airport (ALB) will be provided for departures following the day in Cooperstown. Departure flights should be scheduled for 7:00 PM or later. For those extending their vacation or departing from another airport, transportation to our trip hotel will also be provided. Your trip includes roundtrip transportation between cities and to/from all events. On Baseball Road Trips, we make frequent stops for everyone's comfort. We have a no smoking policy on all transportation provided.